Off The Rails wrote: So you think you can dance. The last of the Cavilia AOAs to be captured before the seasons end (if it hasn't allready)is TP1745 seen in lansdale today. All so seen about today by me was TP 1347 in a new AOA in green ,but it was too fast down Beaufort st on a 950 to make out what the Ad was, but has been identified in the posts above thou. 2318 is having it current AOA removed today ,seen on route to APM burswood unit on Mounts Bay rd after completing a 950 to QEII, and i believe its next aoa is for RAC. With the introduction of the 950 route between Morley Bus Station & QE II Hospital , sWAn Transit buses with AOA have been making a regular apperances to Morley BS. With TP1324 & TP1347 being two recent visitors to Morley. Merc Benz Volgren CR225 O405NH TP1324 AOA for CBUS. TP1347 thou is sporting her new AOA for Domain.com "Thousands of Perfect Property matches" theme. Well done for getting 1347. The horse has bolted from 2318 & it is out on the town tonight sporting a new AOA for an old rainy day friend. I like the green. A variation of that to make it a Transperth livery would make the buses more noticeable rather than the majority of silver. Preview shot of TP2318 in her new AOA for RAC in the early morning light. Better shots to come . Well done you took my bait....I purposely left it stowed in the paintshop bays for you to graph' this morning. That yellow AOA stands out quite well in the early morning! 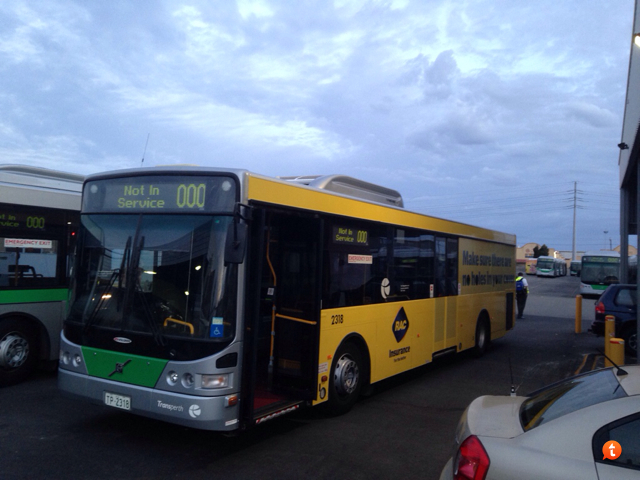 As promised some better shots in the daylight of TP2318 AOA for RAC WA . Here is Mercedes benz O405HN Volgren Cr225 TP1323 with her new AOA for Channel 10 " So you think you can dance" on Beaufort st near second ave on a 950 to the city. Mercedes Benz O405NH Volgren CR225 TP1323 AOA for Ch 10 "so you think you can dance"
And also seen down at Roe street bus station (RSBS) aka "gauntanamo Bay"
Front nearside of Mercedes Benz O405NH Volgren CR225 TP1323 AOA for Ch 10 "so you think you can dance"
front offside of Mercedes Benz O405NH Volgren CR225 TP1323 AOA for Ch 10 "so you think you can dance"
Rear offside of Mercedes Benz O405NH Volgren CR225 TP1323 AOA for Ch 10 "so you think you can dance"
Offside of Mercedes Benz O405NH Volgren CR225 TP1323 AOA for Ch 10 "so you think you can dance"
Rear nearside of Mercedes Benz O405NH Volgren CR225 TP1323 AOA for Ch 10 "so you think you can dance"
Last edited by High Floor Bus on Tue Mar 11, 2014 10:18 pm, edited 1 time in total. Mercedes Benz OC500 CNG Volgren CR228 TP2074 is seen at RSBS carrying her sixth AOA for IInet ,with the theme of " This bus is now your lounge room"
Would that be the bus fitted with Wi-Fi? JC2314 wrote: Would that be the bus fitted with Wi-Fi? 1683 was still running around with that Cavalia AOA this morning. The AoA on 1323 (so you think you can dance) is also up in Brisbane on 1802 (B7RLE, CR228L) Interesting about our one, there is some advertising inside for the show as well, you can't really escape it! And the latest to be done to have a new AOA applied is TP1811 with its AOA for Mazda CX-5 seen here down at Fremantle IC. 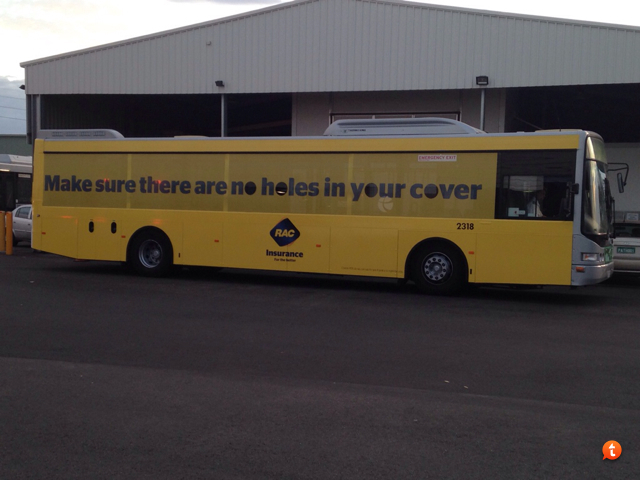 Gee, do you ever wonder how much they actually get paid to put the adverts on the buses versus how much the vinyl costs? and does the operator get the money or does it go to the govt? wayfarer wrote: Gee, do you ever wonder how much they actually get paid to put the adverts on the buses versus how much the vinyl costs? and does the operator get the money or does it go to the govt?